Sixty-four years after Ralph Ellison wrote his seminal novel, Invisible Man, about an African-American man who is consistently unnoticed by the powerful white people around him, it appears that black folks are still invisible to progressives and Democrats. Publicly announced political spending plans for the left this election cycle thus far reveal a gargantuan hole in terms of investing in the work necessary to turn out the voters most essential for any progressive victory in November—people of color, in general, and African Americans, in particular. By election day, nearly $3 billion will have been spent on the 2016 elections by Democrats and progressives. In recent weeks, several major political organizations have publicly revealed preliminary plans to spend more than $200 million. (In addition, the Democratic nominee will likely match the $1.1 billion Obama spent on his reelection, and most Senate and House races will entail millions of dollars of expenditures). The largest independent expenditure operation backing Hillary Clinton, Priorities USA, has stated its intention to spend $136 million on television, digital, and radio ads, with three-quarters of the television ads devoted to attacking Trump in an attempt to influence moderate undecided voters, also known as swing voters (at least 82 percent of whom, by my calculations, based on interpretation of 2012 exit polls, are white). The environmental-advocacy organization NextGen Climate will spend $25 million on registering and mobilizing college students in seven battleground states. Five of the seven target states are significantly whiter than the national average of 69 percent, and only about a third of 18-to-24-year-old people of color are in college. What you won’t see in the announced plans on the left is any money for making sure that black voters turn out in large numbers in the first national election of the post-Obama era. While Priorities USA has said it will spend some of its $5.3 million set aside for radio ads on black radio and an undetermined amount on digital ads targeting African Americans, there are no funds specifically targeted for the proven and effective grassroots, person-to-person work required to get people out to vote. 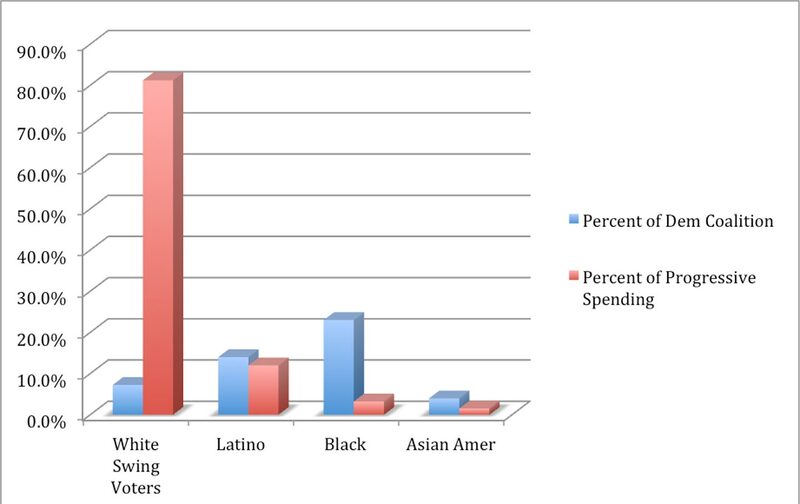 While there is at least a modest, albeit also underfunded, program to mobilize Latino and immigrant voters, the left and its donors have failed to fund anything comparable among African Americans. How is this even possible? The single most frequent question I hear as I travel across the country on my Brown Is the New White book tour is, “Why don’t Democrats and progressives understand the importance of investing in voters of color?” I can think of three reasons for this sad state of affairs: progressives can’t count, don’t care, or can’t see. Simple arithmetic shows the centrality of voters of color to any hopes for keeping Trump out of the White House and reclaiming control of the Senate. Twenty-three percent of all Democratic voters in 2012 were African American. More of Obama’s votes in 2012 came from black folks than came from white men. Nearly half of all Democratic voters are people of color (46 percent in 2012), and even more of the potential voters in 2016 will be people of color (31 percent of all eligible voters, up from 29 percent in 2012—an increase of 7.5 million people). For the past 40 years, voters of color have on average cast 79 percent of their votes for Democrats. If 28 percent of the electorate consists of voters of color, and the Democratic nominee gets 81 percent of their votes and 37 percent of the white vote, Trump loses. For the past 40 years, voters of color have on average cast 79 percent of their votes for Democrats. The math only works, however, if people of color turn out to vote in large numbers. In 2012, Obama won Ohio, Virginia, and Florida by a total of just 292,000 votes. If 300,000 voters of color don’t get to the polls in those states, and 20,000 white New Hampshire voters who voted for Obama switch to Trump, say hello to President Trump. If progressives can count and yet are still not making smart investments, then it’s possible that they are taking black votes for granted because they see those voters as less important than white swing voters who may be receptive to Trump. Many in the media are equally afflicted with this political myopia. A recent 4,000-word New York Times article purported to analyze the electoral dynamics in eight swing states (Florida, North Carolina, Virginia, Wisconsin, Michigan, Ohio, Pennsylvania, and Arizona) and failed to make any mention at all of black people. This despite the fact that Obama got 5 million fewer white votes in 2012 than in 2008 and was only reelected because of the support of African Americans and other voters of color. It’s as if black folks had nothing to do with electing the first black president and are irrelevant to selecting the next president. It’s as if black people are invisible. I personally encountered this attitude of indifference in 2008 when an advisor to a major Democratic donor responded to my suggestion that resources be directed to voters of color by saying, “We’re not focusing on the fringe voters.” Such a mindset will likely be fatal to Democratic prospects for at least two reasons. 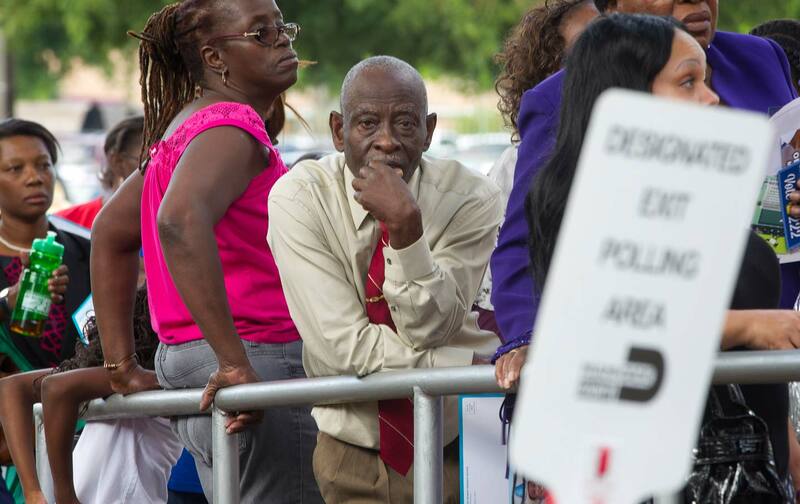 First, black voters must turn out in large numbers in order for Democrats to win. Second, because African Americans are among those most affected by economic inequality in this country, they face more obstacles to exercising the franchise, and they possess fewer resources to overcome those obstacles. Consequently, more attention has to be paid and greater investments have to be made in order to guarantee black voter turnout. The third, and hopefully, most likely, scenario for this absence of intelligent investment is that the various players in the progressive movement are so focused on their respective piece of the puzzle—targeting union members, environmentalists, and white swing voters—that the failure to invest in black voters is an unintentional oversight. While it says a lot about the state of the progressive movement that the first $200 million in spending completely leaves out African-American voter mobilization, at least a lack of coordination is a fixable problem. Whatever the reason, whether benign or intentional, voters of color are largely invisible to too many progressives right now. The good news is that there is still time to learn to count, care, and correct. But it’s June and the clock is ticking.